Welcome to February everyone! First of all, thanks to all of you who participated in our January Sketch Challenge. 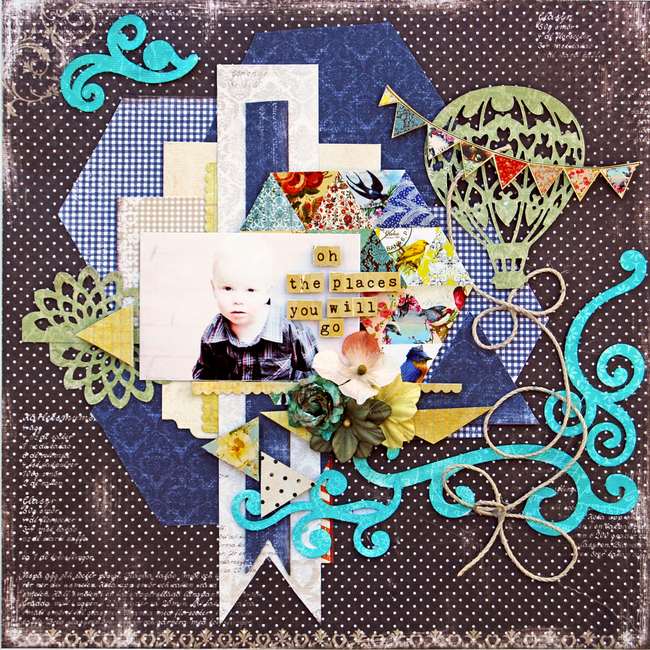 It looks you're off to a great year of scrapbooking! Our sketch designer, Michele Singh, has created another awesome sketch for you to use during the month of February. 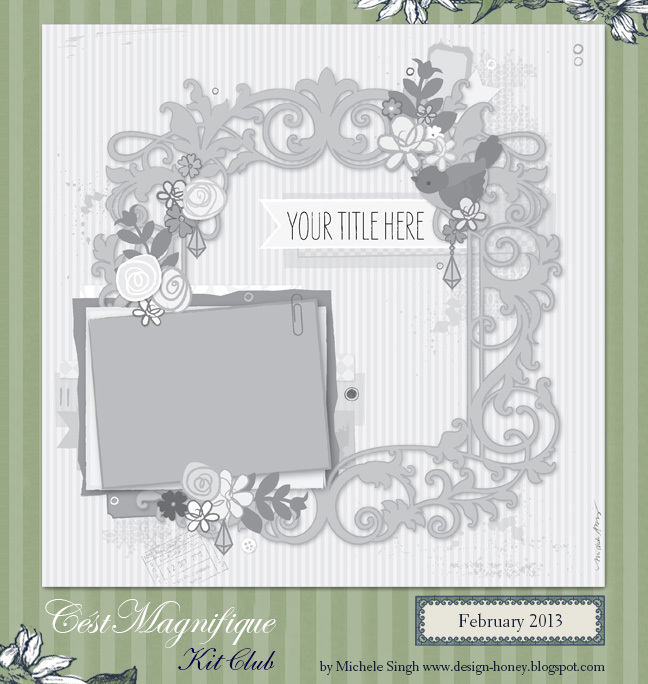 This sketch features the lovely Blue Fern Frame that is in our February Kit, Royal Tea Party. Don't have the frame? - it is available for purchase in our Store, or show us how you interpret the sketch using something other than the frame. Five of our designers used the sketch along with our February Kit. Take a look at how differently each of them interpreted the sketch and the various ways they have altered the Blue Fern Frame. Our guest designer replaced the frame with hexagon shapes. This past summer, one of my hens who had been disappearing on and off showed up with 11 baby chicks she's hatched out in the woods! I had not hatched out my own baby chicks since I was a little girl, so this was especially exciting for me :). I thought the colors in my photo were complimented perfectly by the green & cream shades offered in the kit, and it was a joy playing with the gorgeous Blue Fern Studios frame, decorating it with seed & micro beads, and stamping & inking it to create a coordinating, rustic feel :). I used a picture of my husband and son that I took last spring in the park. I thought the green colors in the photo, fit the green tones in the kit perfectly. I altered the Blue Fern frame to match the layout and added misted canvas resist ferns all around. For the title I used an old piece of plastic packaging. I stamped the word "Loved" using black Staz-on. Then I cut around it and attached it with glue dots. I used the plastic for a challenge we are sponsoring this month at Scrap for Help. This is my take on this months sketch. 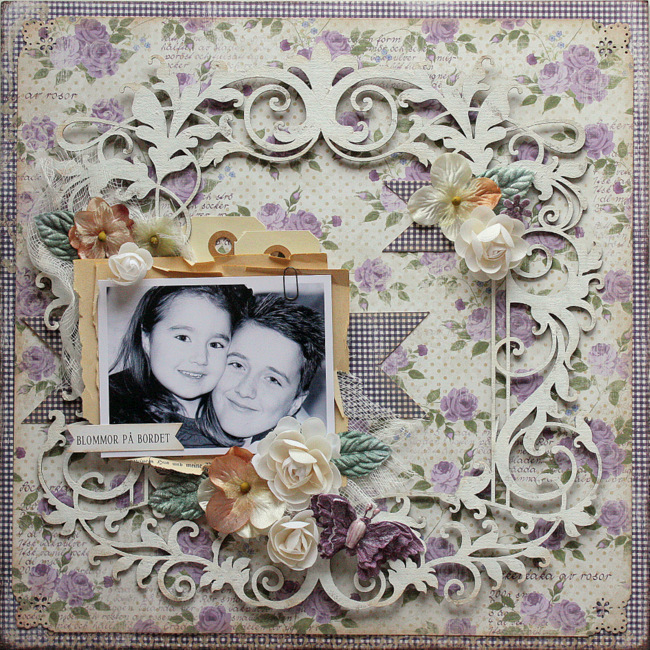 Inspired by the gorgeous sketch, I used the Blue Fern Frame chipboard on my background as a mask to get an unique look. I have also added some extra texture to my background by overlapping multiple stamp designs in different colors. 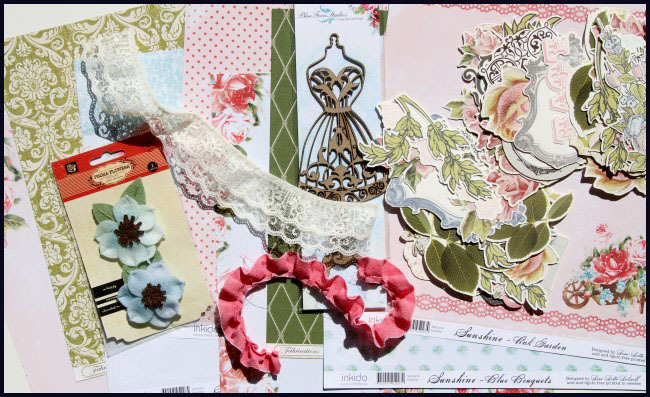 After that, I have used some embellishments that matched with my theme (life´s little details) to decorate this page. Children are beautiful and precious - like flowers on the table (hence the title). The paper with the purple flowers are one of my favourites in the kit this time and I had to use it. The large chipboard frame from Blue Fern Studios is just dabbed with gesso and inked with light brown ink. 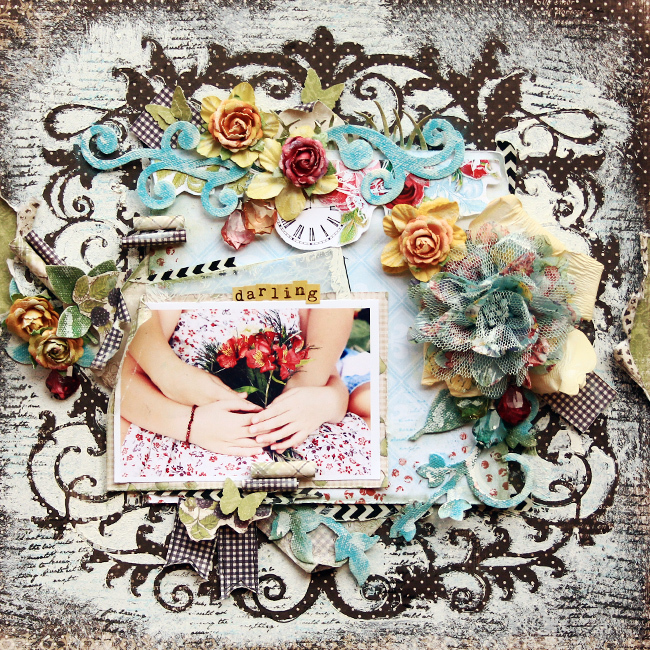 The layout is made for the February sketch provided by C'est Magnifique. This is my take on the sketch. I replaced the decorative frame element with an arrangement of larger hexagon shapes. A few of the Prima canvas resistant swirls were placed strategically to frame the hexagons. The orientation of the photo was kept similar but moved up slightly towards the middle. Now that our design team has inspired you, are you ready to create a layout using the sketch? This challenge is open to everyone, and you may use any supplies that you have. No need to go out and purchase anything! Feel free to interpret the sketch any way you want. Best of all, we have a wonderful prize that will be awarded to one participant, based on a random draw. Here is the prize package Leslie has put together for February. The winner of this prize package will also be able to shop in the Cést Magnifique Store and have your purchase shipped with your prize for no additional shipping costs. 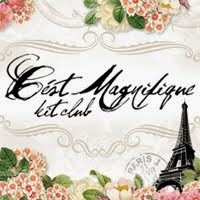 Our second prize, a $10 gift certificate to the C'est Magnifique Store, will be randomly be awarded to one of the sketch participants who obviously creates their sketch layout using a C'est Magnifique Kit. Lastly, we will be choosing 5 (or more) layouts to feature on our Blog when we announce the winners. Deadline for entering the sketch challenge is midnight, February 28 (US time). We look forward to seeing how you use our sketch! Fantastic projects of DT!!! Thank you? it's greate inspiration! love what you talented ladies have done with the kit! You bring out so many color choices that I didn't see when first looking at the reveal. wow your layouts are amazing and so inspirational. Love the kit and LOVE the DT inspiration! Way to go, Folks! Was the winner of this prize announced. I keep looking, but maybe I missed it. First Look at our March Kit! New Prima and January Sketch Challenge Winners!